Record-breaking Peugeot EX1 electric car | What Car? 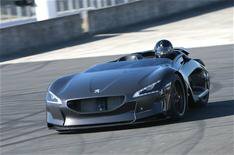 Peugeot's EX1 looks like something Batman would drive, but it's actually the fastest electric car in the world. Two electric motors combine to create 380bhp for the water droplet-shaped two-seat roadster. Thanks to honeycomb carbonfibre composite construction, the EX1 is incredibly light at just 750kg a Volkswagen Golf weighs 500kg more and even a Lotus Elise is at least 110kg heavier. It's quick, then, and yesterday it snatched a range of speed records that the Opel GT Electric has held since 1971. If you're struggling to understand how fast that is, the EX1's 0-62mph is 3.58 seconds, 0.12 quicker than a Tesla Roadster's. It takes just 6.6 seconds to reach its top speed of 162mph. The 30kWh lithium-ion batteries used to power the motors also give the car a claimed range of 280 miles. With a build cost running to many millions the EX1 won't be appearing in a showroom anywhere near you soon. It is, however, going to be on display in its special, purpose-built garage, which recharges the car with solar energy, at 136 on the Champs- Elysees from September 22. It's not going to be at the Paris motor show next week, though. The EX1 is a pure one-off, which has been built to celebrate Peugeot's 200th anniversary.